Looking to increase mass and improve training performance? GAT (German American Technologies) has introduced to the market their post-workout powder that contains an advanced blend of creatine to help users gain muscle and support overall performance. With the use of 6 different types of creatine, the absorption rate is improved and there is faster delivery to the muscles. 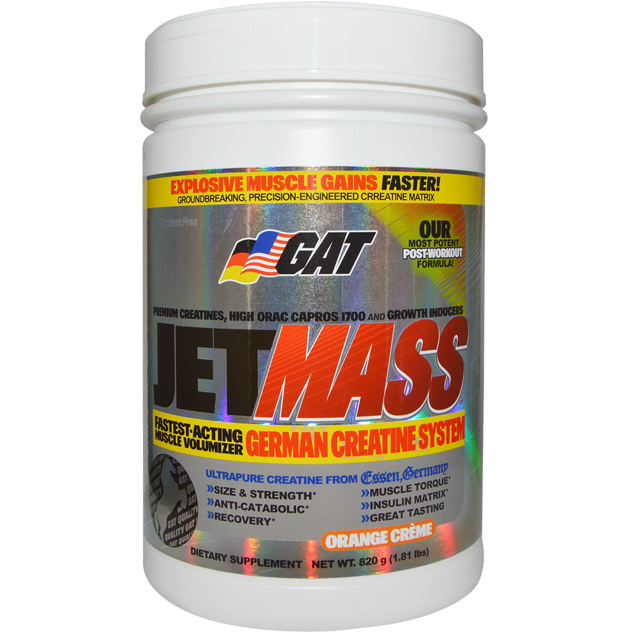 Gat&rsquo;s Jet Mass is a mass gainer that is a protein based supplement that contains added carbohydrates and fats to help with muscle and weight gain. Be sure to check out Jet Mass as it is a multi-functional supplement that offers a range of benefits to help ensure users with greater success. Contains four complex of ingredients. Contains a blend of 6 different types of creatine to help build lean muscle and increase performance. Contains branched chained amino acids (BCAAs) and glutamine that allow muscles to rebuild and recover quickly. Contains a blend of nootropic (cognitive support) and growth supporting ingredients such as GABA, alpha GPC, arginine and lysine. Jet Mass Proprietary System: 6,785mg. Jet Mass German Creatine Muscle Volumizing, Expanding N02 Matrix: German Creatine Monohydrate (Creapure), Waxy Maize (ultra high molecular weight long chain waxy maize), L-Arginine AKG (Alpha-Ketoglutarate), Citrulline Malate, L-Arginine Malate, L-Histidine. Jet Mass Electrolyte Matrix: Cinnamon Bark Extract, Atlantic Kelp Powder, Di-calcium Phosphate, Di-potassium Phosphate, Calcium Carbonate. Jet Mass BCAA Recovery ORAC Antioxidant Support Matrix: L-Glutamine AKG (Alpha Ketoglutarate), L-Leucine, L-Isoleucine, L-Valine, Beta Alanine (As Carnosyn), Taurine, L-Threonine, L-Methionine, Capros Super High-ORAC Super antioxidant (Phyllanthus emblica), Acai extract, Mangosteen Extract, N-Acetyl-Cysteine, Vitamin C.
Jet Mass Anabolic Growth Inducing/Anti-Catabolic Nootropic Matrix: L-Tyrosine, Alpha GPC, Arginine Ethyl Ester HCL, Glycine, Glutamine Peptides, L-Lysine HCL, Conjugated Linoleic Acid. Jet Mass has an extensive nutritional profile that is well-rounded especially for high intensity trainers. Jet Mass is mainly comprised of the purest form of creatine monohydrate and other forms of creatine in the blend which is designed to assist in building lean muscle as well as increasing strength and size for greater generation of muscle power for athletes or body builders. The blend contains waxy maize which is a slow digesting carbohydrate matrix that helps with energy and recovery. Together with insulin supporting ingredients (e.g. cinnamon bark extract) it can help prevent muscle fatigue and deliver creatine to the muscles directly. Jet Mass works best as a post-work out recovery by delivering key anabolic nutrients and encouraging improved cell hydration. This results in increased muscle cell uptake of amino acids and boosts protein synthesis resulting in faster recovery and improved gains in lean mass. During intense workouts, your muscles become sore and your body starts to run low on power Jet Mass uses these ingredients to replenish what is lost and help rejuvenate muscle growth and optimise recovery faster for you to return to the gym faster. It also contains an electrolytes matrix to help users hydrated as creatine can soak up large amounts of water. The next set of ingredients in Jet Mass are mainly amino acids that aid in recovery and help instigate the muscle building process. With the added BCAAs, it helps to replenish lost amino acids which can occur during exercise. Jet Mass’ special feature is that it provides other ingredients which work together with creatine to amplify the effects of muscle building. It also contains nootropics (cognitive support) that allow your brain to communicate more effectively with the rest of your body. The flavours available for Jet Mass are namely Black Cherry, Orange Crème and Tropical Ice. The most popular flavour is Tropical Ice as it does not leave any aftertaste and the flavour isn’t too sweet or pungent. The other flavours are just as delicious, tangy and refreshing. Additionally, there shouldn’t be any issues with mixability. Although Jet Mass’ ingredient profile is well-rounded and extensive, the only disappointing factor that didn’t result in a 10/10 is in relation to the proprietary blend that only indicates the total amount in the blend which leaves some users unsure the amount they are getting from each ingredient. Other than that Jet Mass is a great supplement for users to add to their stack. Gat’s Jet Mass is a great post-workout complex that gives users an improvement in recovery time, strength and overall muscle gains. By recovering faster, you can work out more frequently at a heightened intensity and thereby stimulate more muscle growth. Like all other Gat products, Jet Mass provides you with a supplement that has many benefits helping you to achieve greater goals.